With so much happening this week in our push to advance Constitutional Carry, we wanted to make sure you had the latest information. That’s why we’ve prepared this short video update for you! Please watch it, and then share this with your friends or family so they can get involved in this effort. First, we need your support to help us run our program as we mobilize Iowans to advance this bill. Mail, email, robo calls, social media work — we are using them all! Any help you can provide would be put immediately to this fight! Second, we are preparing a mountain of petitions to deliver to the legislature in support of this bill. Make sure that you’ve signed your petition in support of this legislation. Right now, while we have a pro-gun majority in the Capitol, is our chance to get this done. It may be years before we can do this again. That’s why we need to maintain the pressure! P.S. 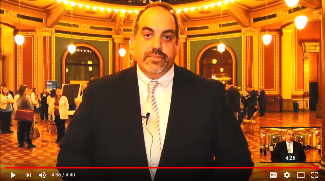 To make sure that you’re up to speed on the fight to pass Constitutional Carry, we’ve prepared this short video update from the Capitol. Please take a moment to watch it. When you’re done, please consider a donation to Iowa Gun Owners so we can continue to mobilize as many gun owners as possible! Your donation, of any amount, will be put right to this fight! Please send help if you can!